Shirts With Random Triangles: Georgia adds 3-star DE Zion Logue to its 2019 recruiting class. Georgia adds 3-star DE Zion Logue to its 2019 recruiting class. Zion Logue. Image via Dawg Nation. Georgia added its 11th commitment to its 2019 recruiting class on Sunday. Lebanon, Tennessee rising high school senior defensive end Zion Logue, announced his commitment to the Bulldogs on Sunday. 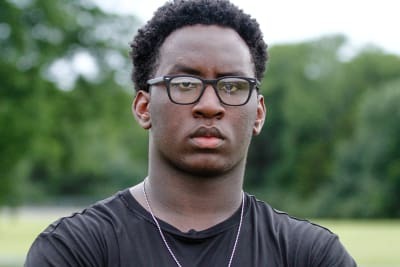 247Sports grades Logue as a composite three-star strong-side defensive end prospect. The recruiting site's composite prospect rankings for 2019 rank Logue at no. 42 among SDE prospects, at no. 21 among prospects from the state of Tennessee, and at no. 650 nationally. Logue attends Lebanon High School in Lebanon, Tn. He stands 6'5.5, and weighs 287 lbs. First "Aquaman" trailer unleashed at ComicCon. This just in: David Pollack plays Fortnite. Former Cal WR transfers to Georgia. Virginia Tech dismisses DB Mook Reynolds.